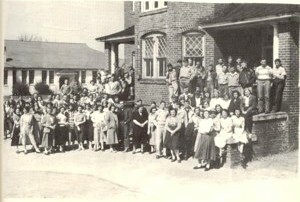 �There are many memories and lessons acquired at the Old Watkinsville School. It was a simpler time- Post WW II. The Korean War came in the early fifties ��. Some lifetime friendships and bonds were formed. It makes the OCHSAA Annual Alumni banquet a fun time. 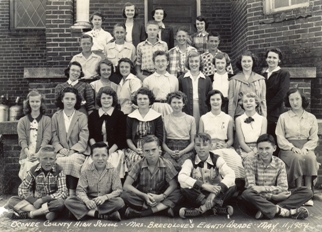 Mrs. Dorothy Breedlove was my homeroom teacher in the eighth grade. 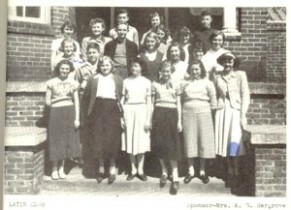 The Eighth Grade at Watkinsville in 1953-4 included students from the Bishop Grammar School.Mrs. Breedlove was a friendly teacher and I really liker her. Mrs. Breedlove’s husband was William Breedlove who had served as our State Senator in the days of the County Unit System. When he would spot me on the school grounds, he said, “So you are Rayford’s Boy!” or call me “Little Rayford” and would display a wide grin. He was a farmer and active in agriculture associations. Later as a commissioner, Betty and I attended a number of functions (Oconee River Soil Conservation Dinner in Jefferson on several occasions, Civitan functions) with the Breedloves and Jeff and Gladys Cain and others. We became good friends. My Ninth Grade Homeroom teacher was Mrs. Helen Booth who also taught biology, science and chemistry.She was a very pleasant person and a good teacher. We liked Mrs. Booth. In later years, I would interact with her at Watkinsville, at Booth’s Sundries, where she worked with her husband, Jim, after her retirement. 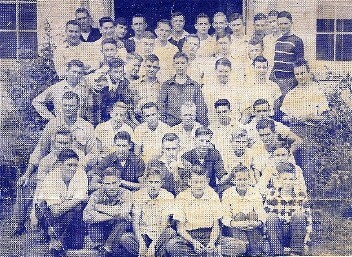 The class was in the Dr. McGarity Building on Third St at the corner of the Ball-field. We had our own softball field in our corner. Some of our buses would arrive early and we would play “roll at the bat”. The bat and ball were kept in the locked room with chemicals used in chemistry labs. I was small enough to crawl between the metal strips and get the ball and bat for us early arrivals. It was during that time that the Dave Garroway Today Show started on television. He had a chimp named “J Fred Muggs” who became a real personality. Cecil Hammond was strong and could really bat a ball. In the ninth grade, I affectionately called him “J Fred Muggs”. We had some good times in those days. My Tenth Grade homeroom teacher was Mrs. Kathryn Hargrove who also taught English and Latin. I took two years of Latin from her and learned to love her. We corresponded when I was in service and I visited her from time to time as an adult. 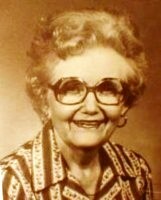 She worked from the late thirties at Watkinsville and taught until the eighties at OCHS on Mars Hill Road. She was an excellent teacher. She taught my daughter, Jennifer, Latin at the Mars Hill School before she retired. She later told me that I was a fine student in the 10th grade but having me as eighth grader in “study hall” at Watkinsville caused some anxiety….She called the eighth grade the “goat age”. Kathryn Hargrove started teaching at Watkinsville in the late 30’s and taught until the 80’s at OCHS – Mars Hill Road.She was the librarian and I was in Study Hall there, home room teacher in 10th Grade at Watkinsville, Latin at Watkinsville and Mars Hill Road. I came to be close to Mrs. Hargrove and later visited and wrote her in my College and Army days. Some of our favorite people were the Lunchroom Ladies. We would go in a line in front of a counter and they would each place a helping of a food on our plate. I remember the food as tasty and good. For a few years after WW II, we had bulk cans of peanut butter and butter. 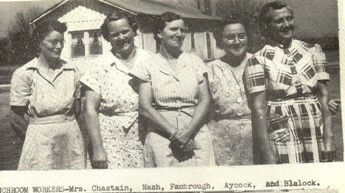 These ladies learned us by name and were always cheerful and smiling. The principal of Watkinsville School and later at OCHS on Mars Hill Road was Mr. A. P. Henderson. He was soft spoken. He taught eighth grade math and nicknamed some of us during that time. He called me “Wen DELL” with emphasis on the last syllable and he called Jimmy Christopher (Lewis) “Jimmy Lou” until Jimmy asked him one day to stop. Of course we students tagged Jimmy with that nickname for the rest of our High School years. Mr. & Mrs. Henderson and Mr. & Mrs. Jeff Cain accompanied our Class of 58 on our Senior Trip to Washington and New York. Much of our funds were raised in the “senior store” in the Gyms during basketball games. When I reached middle school, Jeff Cain was the Vo-Ag teacher. I joined the FFA in the ninth grade and had my first exposure to Chicken Mull –many of Mr. Cain’s students went on to be excellent Chicken Mull Chefs, George Hillsman, Homer Hansford, the Shelnutt brothers. It has spread in popularity and is used as favorite fund raiser by churches and civic organizations. Mr. Cain later became School Superintendent and helped Mr. Henderson preside at our OCHS graduation on June 2, 1958. Mr. & Mrs. Cain were later friends and we interacted socially and in civic activities after Betty and I moved back to Watkinsville (from Cobb County) in 1970. There are many memories and lessons acquired at the Old Watkinsville School. It was a simpler time- Post WW II. The Korean War came in the early fifties and a Chastain boy of Oconee County died in that Conflict. If my memory is correct, he was a son or relative of Mrs. Chastain who worked in the lunchroom. Some lifetime friendships and bonds were formed. It makes the OCHSAA Annual Alumni banquet a fun time.